Imagine it’s a warm summer day…you grab your picnic basket, some friends or family, and sprawl out on a lush park lawn. Look around and you will see children playing soccer, softball or perhaps flying a kite across an expanse of green turf. Grass is everywhere. The University of Massachusetts Amherst is hard at work on ways to make turfgrass healthier. Healthier, you say? Yes- using less water, less fertilizer and other inputs while still maintaining resilient grass that bounces back, even after high traffic, this is the goal. That includes turf on which kids, dogs and professional athletes play, your front lawn and, really, anywhere that grass grows under your feet. 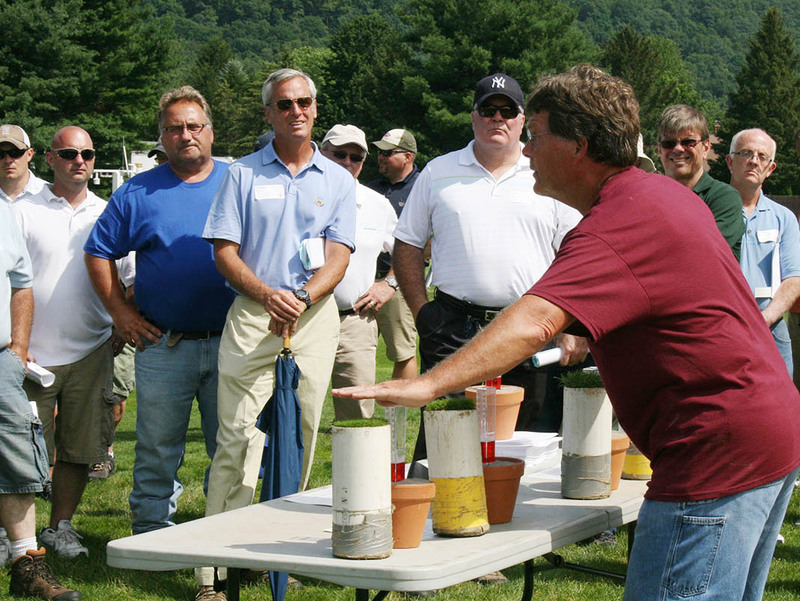 Researchers devote entire careers to studying and managing turf. So UMass researchers are pursuing techniques to reduce the amount of water needed to grow turf while still ensuring its healthy growth. They explore solutions to areas where water protection is essential but surface run-off, with possible pollutants, is a problem. And more recently, research is unearthing methods to grow more drought-tolerant turf, again, addressing the need to decrease water use. Where does turf grass research take place? At the Joseph Troll Turf Research Facility in Deerfield, opened in the early 1970’s. A full-time superintendent oversees the operation of the 18-acre facility year-round. Research is typically conducted at the facility during every month of the year. During the growing season, as many as thirty or more separate or interrelated projects may be underway at any given time. These studies include: selection and uses of turf; pest management; stresses to turfgrass including heat, cold, drought, traffic; best management practices; and environmental impact. UMass can claim bragging rights to having established the first turf science program, in the United States, in 1947. 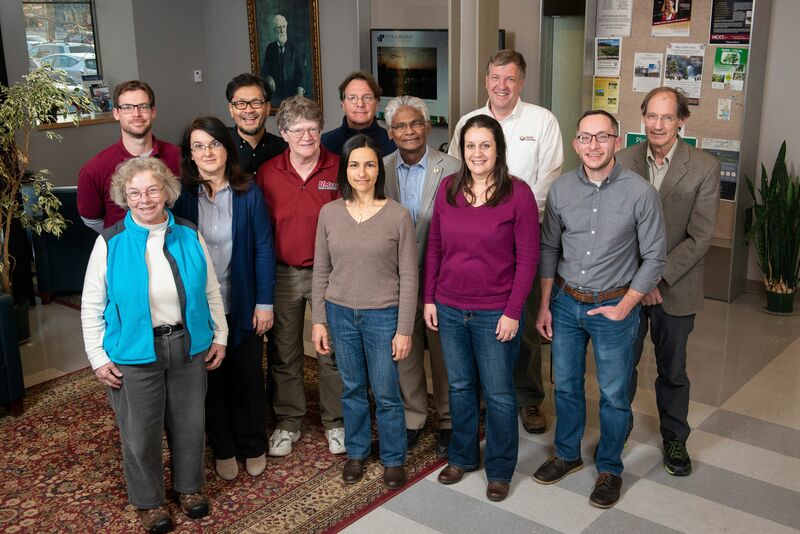 The UMass Extension Turf Program boasts an integrated, research-based team of faculty, graduate students, undergraduate students, and technical staff. They work together to address the highest priorities of turf-related industries as well as the needs of citizens of the Commonwealth. Their goal is to research and share knowledge on safe, efficient, economically-viable and environmentally-sound turf management with emphasis on natural resource protection. Why do they do this work? Owen says it is to offer original contributions to science and to share the most useful and cutting-edge knowledge to students in the classroom. 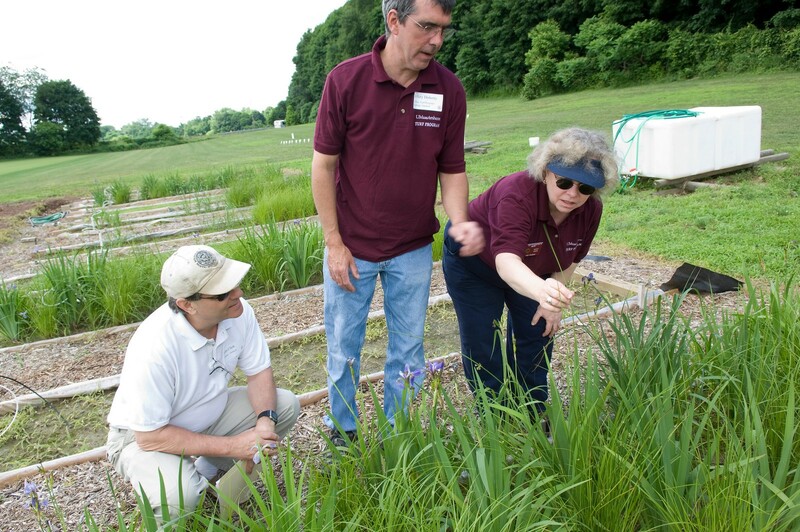 Over the years, UMass educational programs have been created to meet the needs of the citizens of the Commonwealth and the green industry. These include the well-subscribed Winter School for Turf Managers (established in 1927) and UMass Extension's Green School. Publications feature the Professional Guide for IPM in Turf for Massachusetts, Protocols for an IPM System on Golf Courses, Integrated Pest Management Protocols for Turf on School Properties and a host of fact sheets available online. One of Scott Ebdons’ most important tasks is to develop sustainable practices that reduce the stress on turfgrass. Part of his job requires that he continually studies and evaluates the ideal mowing height, water requirements and fertilizer requirements for turfgrass on sports fields. As such, his research is highly dependent upon understanding environmental and climatic conditions. And so he monitors the turf daily on his 1,200 individual research plots. His research has shown that significant savings in water, fertilizer, and chemical input are achieved by selecting the appropriate cultivar or variety for its intended use. Currently, he is studying traffic tolerance of different species and their cultivars under actual athletic competition using real players (athletes) rather than relying on simulated traffic machines. Athletes have relevant opinions on ball bounce, footing and traction that are important to how sports are played which machines cannot offer. Kostromytska is an assistant professor of turf entomology whose specialty is bluegrass weevil, a destructive pest found on golf courses. She has researched host plant resistance, insecticide resistance, biocontrol options, chemical ecology and reproductive diapause (hibernation) of annual bluegrass weevil. Other turf insects about which she has become an expert include white grubs, mole crickets, billbugs, chinchbugs and cutworms. Her research focuses on gaining better understanding of the biology and ecology of turfgrass insect pests so she can develop sustainable management strategies that reduce insecticide applications. Kostromytska is also investigating the mechanisms that can make insects resistant and then developing resistance mitigation programs. Michelle DaCosta analyzes and encourages green grass to grow with one caveat: it has to use less water. Her research focuses on identifying turfgrasses that grow best with the least amount of water. Why is this important? With increasing effects of global climate change, including temperature extremes and drought, it behooves turf researchers, and all those who use turfgrass, to identify plants that can thrive on a water-restricted diet. Her laboratory examines traits and stress responses associated with tolerance to different environmental stresses relating to wild fluctuations in climate. 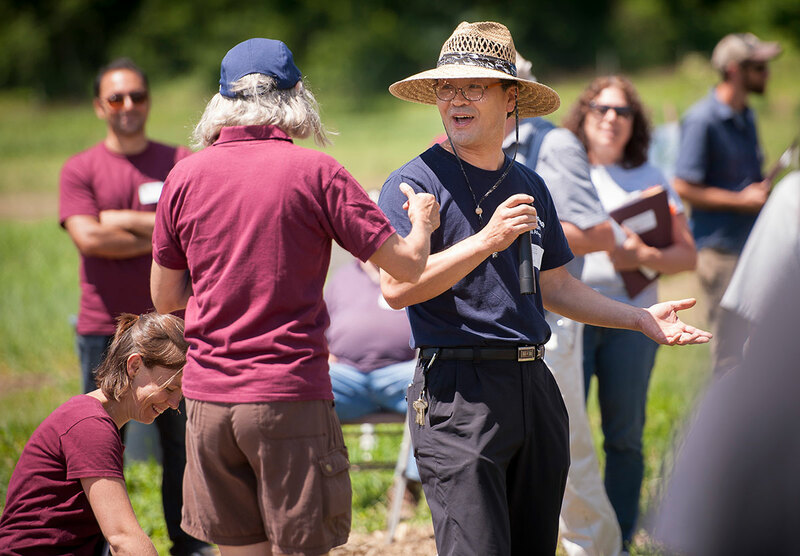 Jung’s work in research and extension focuses on providing his clients with economically and environmentally sound disease control strategies that are based on solid research. Jung’s current research centers on a disease known as dollar spot, which is caused by a pesky and resistant ‘Superbug” fungus that plagues professional turf. As a Superbug, this fungus has special genetic characteristics that allow it to overcome many of the chemical fungicides labeled for its control. Jung’s research focuses on mapping out these Superbug genes in order to develop quick and accurate molecular tools for detection of resistance in the field. Knowing what type of resistance, you have in the field allows for more efficient and effective management strategizing, saving superintendents lots of money, time and resources. Reducing pesticide use altogether is a particular interest of Jung’s. To that end, Jung explores the efficacy of alternative methods for management of dollar spot, including cultural practices like using a roller on fairways. Rolling is a common management practice used for smoothing out uneven surfaces of professional turf. However, Jung’s research has shown that this practice may also play a roll in reducing instance of dollar spot in the field. In addition to his work with dollar spot, Jung has also received wide recognition for his hand in developing some of the first DNA marker technology for Kentucky bluegrass and Bermuda grass. Using this technology, for example, it is possible to determine if two grasses are genetically the same or different. This is useful when detective work is necessary to figure out if the cultivar you bought matches the certified cultivar you were promised when you bought it, or to determine if there was a contamination somewhere along the line. This technology was even once used to help trace a car back to the field it was stolen from! How Can a Wetland Clean Equipment-Wash Water? After you mow your lawn, have you noticed that clippings from dried grass cake up on the inside of the mower, or that your blades rust out? This is the result of decomposition of the clippings, which hold water and promote rust. As you wash the clipping off, grease, oils, sprays and fertilizers may also come off. And where is a safe place to get rid of this debris? The answer to that question is especially vital for professionals who manage acres of turf for a living. Voila! For professionals the solution lies with building a wash station followed by a constructed wetland with a liner. The concept is to capture and treat water that rinses residue off mowers in a safe manner for re-use. 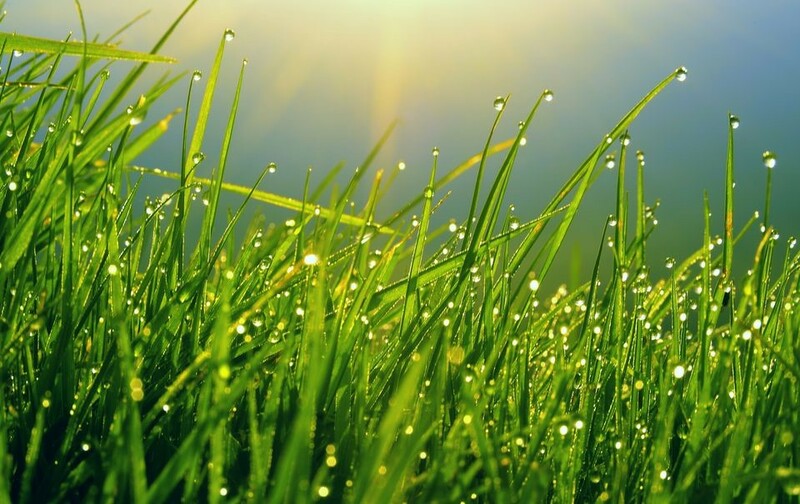 In light of water shortages and increasingly frequent drought conditions, it is becoming crucial to find ways to use captured water for growing healthy turf. Sustainability is the overarching goal of this project. Mickey Spokas who received her doctorate on the science of artificial wetlands worked with Michelle DaCosta to create the first wash station and wetland at the UMass Joseph Troll Research Facility. 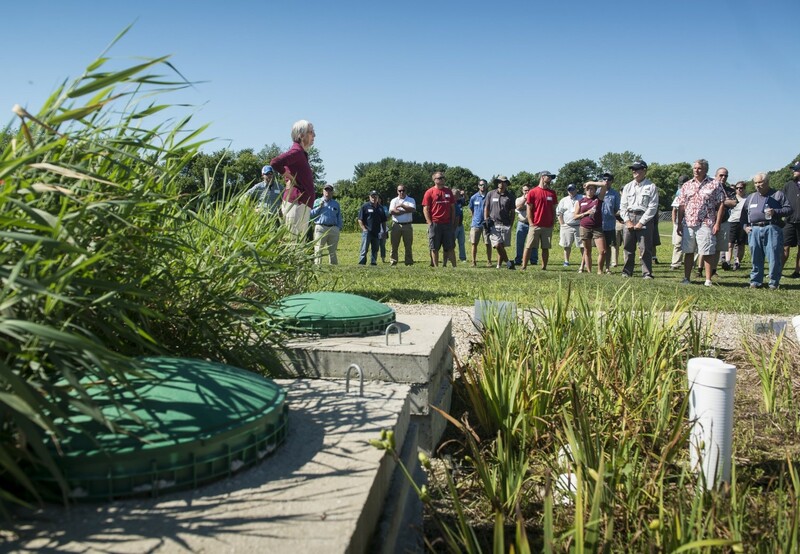 Since the wetland was built (2011), hundreds of turf specialists, sports superintendents and other professionals have attended workshops on how to create one in their communities. Click here for more.